Congress is concerned that a serious rift may be developing in the longstanding spaceflight partnership between Russia and the United States. Today (May 15), three high-ranking members of the House of Representatives' Science, Space and Technology Committee sent a letter to NASA Administrator Charles Bolden asking him to explain the current state of the partnership — specifically, whether recent comments made by Russian Deputy Prime Minister Dmitry Rogozin could endanger efforts to keep the International Space Station operating beyond 2020. Rogozin also said Russia does not plan to keep cooperating with the U.S. on the International Space Station (ISS) project beyond 2020, adding that Russia could continue to use the orbiting lab without American help. "Our international space partnerships, including our partnership with Russia, have historically endured political division. But Deputy Prime Minister Rogozin's statements raise serious concerns about the strength of those partnerships," Reps. Lamar Smith (R-Texas), Mo Brooks (R-Ala.) and Steven Palazzo (R-Miss.) wrote in the letter. Smith chairs the Science, Space and Technology Committee, while Palazzo and Brooks serve as chairman and vice chairman, respectively, of its space subcommittee. "If Mr. Rogozin's statement proves to be accurate, we will have to take a step back and evaluate the costs and benefits of maintaining ISS beyond 2020 without our Russian partners," they added. The letter asks Bolden to give the committee information about the current state of the U.S.-Russian spaceflight partnership; an accounting of all the services and capabilities that Russia and its space agency provide to keep the station running; an assessment of how a Russian withdrawal would affect ISS operations beyond 2020; and an assessment of how a restriction on the export of Russian rocket engines might affect NASA. Bolden should provide this status briefing by May 28, the congressmen wrote. You can read the entire letter here. NASA officials have already issued a statement in the wake of Rogozin's comments, stressing that ISS operations remain unaffected. 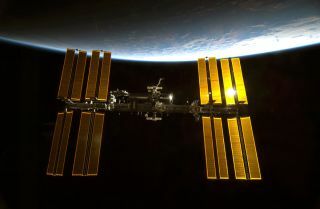 "Space cooperation has been a hallmark of U.S.-Russia relations, including during the height of the Cold War, and most notably, in the past 13 consecutive years of continuous human presence on board the International Space Station," the statement reads. "We have not received any official notification from the Government of Russia on any changes in our space cooperation at this point." NASA officials announced in January that they intend to keep operating the space station through at least 2024 — a four-year life extension for the $100 billion orbiting lab, which is a joint effort involving 15 different nations. Construction on the huge spacecraft began in 1998, and it has been occupied continuously since November 2000. Since the retirement of the space shuttle in 2011, the U.S. has been dependent on Russian Soyuz spacecraft to ferry its astronauts to and from the space station. But NASA is trying to change that situation, encouraging the development of private American astronaut taxis via its Commercial Crew Program. The space agency hopes at least one private manned spaceship is up and running by 2017.